Though this looks simpler than my other cakes… it actually took a lot of time to make! 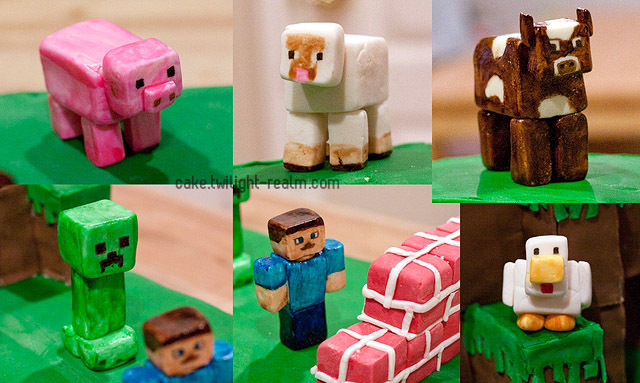 We thought Minecraft would make a fun and cute cake, so we chose the 4 original animals and a scene where a Creeper sneaks up on a player who is trying to build a house. This is made up of 3 types of cake: gluten-free yellow cake (top most), normal yellow cake (middle), and chocolate cake (main bottom). They’re all covered with peppermint buttercream, then vanilla fondant (green) and chocolate fondant (brown). 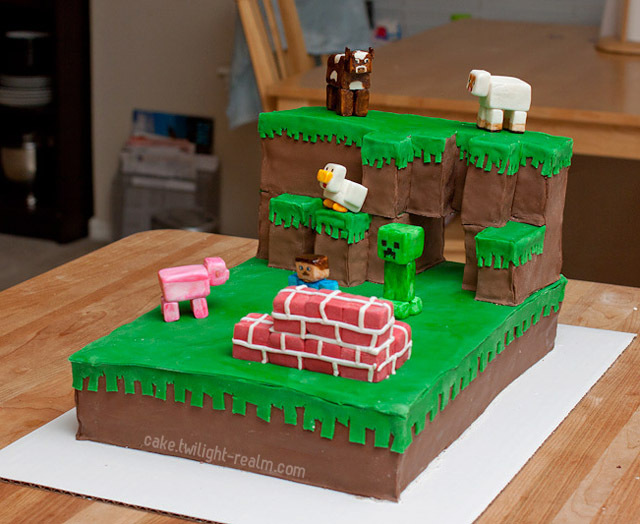 I actually went into Minecraft’s creative mode to “sketch” out this cake. I then took those dimensions and mapped them onto graph paper, which I used as a guide when carving the cake. 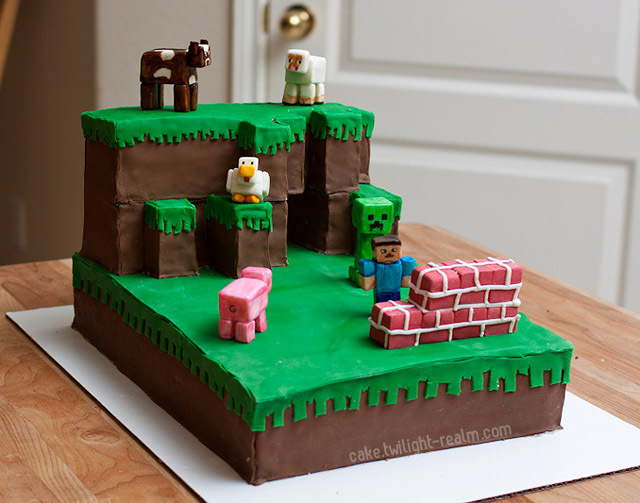 I wanted to make the cake blocky with sharp corners and edges. I would normally cover most of it with one sheet of fondant draped over the edges, but instead, I cut out individual panels and covered each wall separately. The elevated part has a tunnel in it, which you can see behind the Creeper. 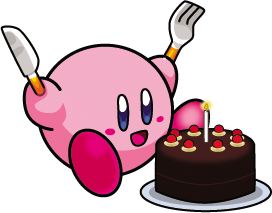 I was able to do this by putting each layer on a cake board, so that it’d be supported over that open area. The figures are made with gumpaste, and I decided to hand paint them. Most things in Minecraft are pixelated with a mix of colors, and hand painting gives a similar uneven, splotchy look. I spent 3 days just on the figures since they needed time to dry between sculpting, painting, and assembly.